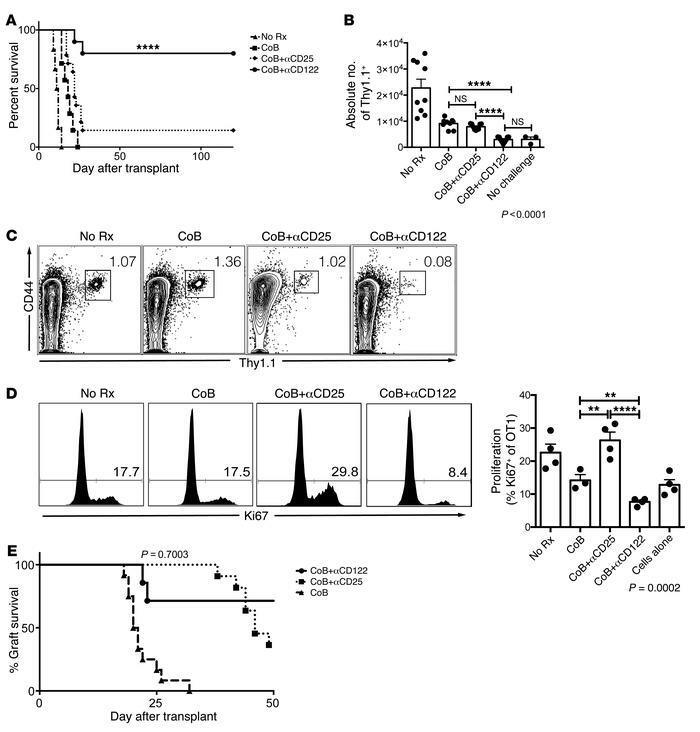 Antigen-specific memory T cells do not require high-affinity IL-2R to mediate CoB resistant rejection. (A) Utilizing the same model of memory CD8+ T cell mediated graft rejection as modeled in Figure 3, we evaluated the relative importance of the high-affinity IL-2 receptor by blocking CD25, compared with blocking CD122, which interrupts both the IL-2R and IL-15R. Untreated mice rejected rapidly (black triangle, MST = 11 days). CoB alone led to costimulation-independent rejection (black squares, MST = 16 days). Combined CoB+αCD25 (black diamonds, MST = 23 days) failed to prevent memory CD8+ T cell–mediated CoB-resistant rejection, whereas combined CoB+αCD122 resulted in indefinite graft survival in the majority of transplant recipients (black circles, MST > 100 days, P < 0.0001, n = 6–13 per group, Mantel-Cox log-rank test). (B) CoB+αCD122 synergistically controlled the expansion of antigen-specific CD8+ T cells during recall responses more effectively than CoB or CoB+αCD25 (P < 0.0001). (C) Representative FACS plot demonstrate reduced frequency of antigen-specific cells in CoB+αCD122-treated animals compared with CoB or CoB+αCD25. (D) CoB+αCD122 therapy resulted in a significant reduction of antigen-specific cells entering cell cycle, demonstrated by reduced Ki67 expression in representative histograms and the corresponding graph comparing CoB+αCD122 versus CoB or CoB+αCD25 (P = 0.0002). (E) In the BALB/c to C57BL/6 skin transplant model, a primary alloimmune challenge, the addition of αCD25 therapy (black squares), which interrupts the high-affinity IL-2R, demonstrated similar efficacy in prolonging allograft survival as the addition of αCD122 (black circles), which blocks both the IL-2R and IL-15R complexes. P values were generated by 1-way ANOVA followed by Bonferroni’s multiple comparisons test. Bars represent the mean ± SEM of 3–9 mice per group. Results are representative of 5 independent experiments. **P < 0.01, ****P < 0.0001.